Since the mall has very limited capacity of 2/4 wheelers parking, we (both me and shaddu) parked our bike a block away and walked to the mall. To our surprise we found a ocean of vehicles in that parking lot as well. The mall has a â€œ1,400 seat multiplex, games such as carousels, bumper cars and simulator theatre, bowling alley, sports bar, restaurants and food courtsâ€ according to Project Monitor. Apart from all these the mall has who is who of Indiaâ€™s retailers, Big bazaar, Pantaloons, 99Dollor store, Archieâ€™s, Provogue, Planet M etc. THE RUSH at Treasure Island was so huge that late in the evening the doors of the multiplex had to be shut for the public. But even then people simply refused to listen demanding that they be let in. 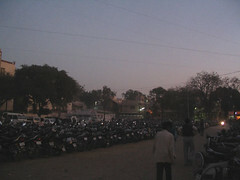 With people milling around, it became impossible for those already inside the multiplex to come out. Police force had to be called in to tackle the crowd. 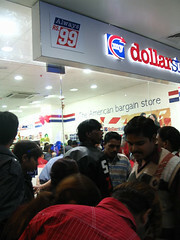 Where ever I go, be it McDonalds or be it Dollar store I see a huge queue of people waiting to enter the store. The dollar store people have to close the store to prevent people from barging in. 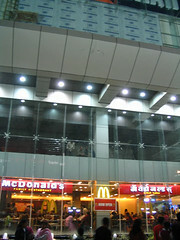 McDonalds would have failed in maintaining the queue timings. Even the escalators were not spared. 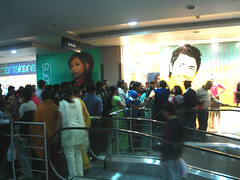 There is a huge crowd at the escalator leading to Bib bazaar in the ground floor. 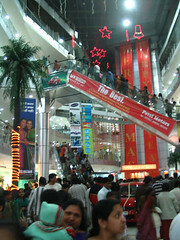 Add to this the fact that Indorians are seeing escalators for the first time. Lot of women with sarees found it tough negotiating with the moving stairs. To top it all the lifts were not yet functional. At the outset it might seem that malls will takes the business away from the traditional mom&pop stores, but I think mall economics work in a different way. My argument: Malls increase the consumption. 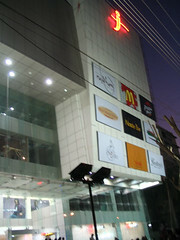 Malls present lucrative and cheap credit options, which encourage people to indulge in a spending spree.